Alan Bowman finished 43-of-59 passing for the fifth 600-yard game in Texas Tech history, and the Big 12 single-game record for a freshman. 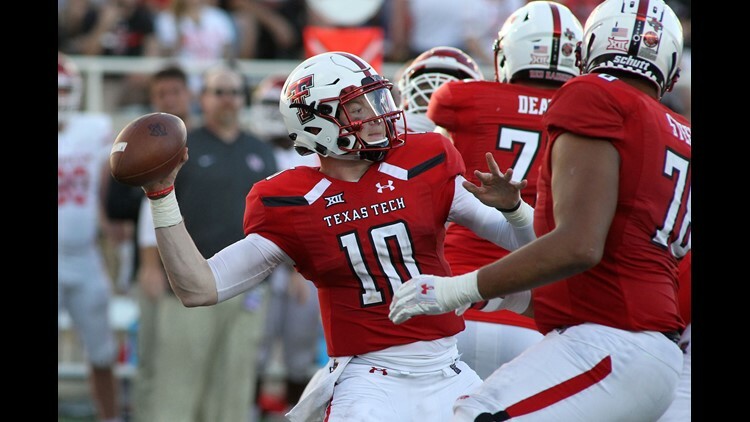 LUBBOCK, Texas (AP) - Texas Tech true freshman quarterback Alan Bowman threw for 605 yards with five touchdowns - three to Antoine Wesley who set a school record with 261 yards receiving - and the Red Raiders beat Houston 63-49 on Saturday. D'Eriq King was 30-of-51 passing for 431 yards and five touchdowns for Houston (2-1). The junior quarterback has 12 passing TDs already this season. He also ran for a score, his fourth rushing TD this season.